The Prince of Wales' plume enfiled in the coronet of a princess, resting on a waving scroll bearing the motto ICH DIEN. Surmounting the coronet, and shaded by the tips of the drooping plume a circle with the regimental motto NUNQUAM CEDE in relief. 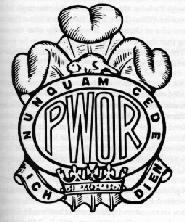 Above the circle a beaver, and within, the letters PWOR. Honourary Distinction: The Badge of the Stormont, Dundas and Glengarry Highlanders with the year-dates 1944-1945 emblazoned on the Colours. Go back to the Infantry Regiments page. Go back to the Army home page.